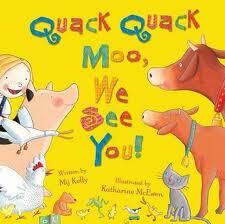 I found this book in the library and it's been a massive hit with all of us. Poppa Bombola knows he's put his "darling daughter" somewhere safe, but he just can't remember where. From the first page, the reader can see that his daughter is in a baby carrier on his back, but he's unaware of this and so turns the farm upside down looking for her, asking the animals in turn "I know I put her down somewhere, so where's my darling daughter?" My 3-year-old, Joe, loved that he knew where the child was and the daddy didn't. From the first page, he was pointing and shouting "She's THERE!" It's great fun to read and we've even started to sing the refrain. As a parent, I particularly liked the fact that no mother is mentioned, the father is looking after the daughter alone and even though he can't quite remember where the child is, it's clear that she really is precious to him. 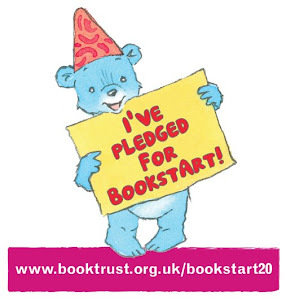 Great fun (as are the illustrations by Katharine McEwen). 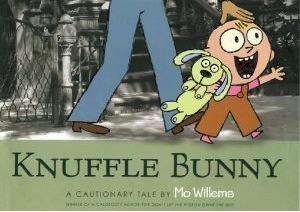 I've already mentioned how much we love Mo Willems, and we first discovered him via this very funny story. The book is filled with jokes for children and parents alike, and completemented by gorgeous illustrations, which - I hope you can see on the cover - are colour drawings on photographs of Park Slope, Brooklyn (where Willems lives) (Trixie, the toddler, is based on Willems’ own daughter). 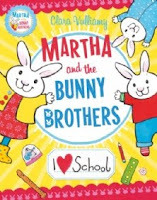 This is definitely one of our favourites and I can also highly recommend Knuffle Bunny Too and Knuffle Bunny Free. Because I'm well-known to be New York-crazy, a friend bought this for my 40th birthday and it's just gorgeous. 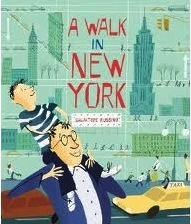 There’s no story as such, it’s just a boy and his dad exploring New York with accompanying facts and figures (like ‘More hot dogs are eaten in New York than anywhere else in the USA’) and gorgeous retro illustrations. I read it with 7-year-old Harry and he immediately demanded that we head to New York asap. If only. A lovely book. When I got this book last week, there was almost a fight - it's just so bright and happy-looking, we all wanted to get our hands on it. I won, obviously (the envelope was addressed to me) and after a quick flick through, knew it was going to be a popular one. It's Martha's first day of school and she's really excited, but she's a bit worried about how her two little brothers will manage without her, so she forms the Happy Bunny Club to keep them occupied. Then she gets on with the important business of getting herself ready for school. The publishers describe it as 'pure sunshine in picture book format' and they're spot on. It's LOVELY. Thanks so much to HarperCollins for sending it to me.